The Sanyo TP1000 and TP1000E high fidelity disc players have been designed and engineered to provide accurate speed and minimal wow and flutter. This is achieved by using a brushless direct drive DC motor and a 340mm diameter, 2Kg turntable platter with stroboscope. The high quality tonearm has been assembled on a die cast base. Sanyo TP 1000 / TP1000 owners manual, service manuals and schematics are for reference only and the Vinyl Engine bears no responsibility for errors or other inaccuracies. The PDF files are provided under strict licence. Reproduction without prior permission or for financial gain is strictly prohibited. This website is not affiliated with or sponsored by Sanyo. Posted Thu, 04/22/2010 - 16:04 by tinojax. 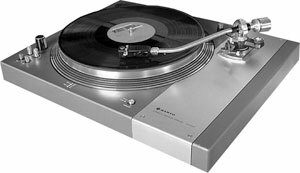 I am the new owner of a Sanyo Plus Q50 Turntable (not a TP 1000). It seems to be a well built unit. I've been searching for information on this unit but have come up empty. I can't even find specifications. Does anyone have an owners manual and/or service manual or just the basic specifications for this? siemens 777 similar to Q50? Posted Sun, 05/09/2010 - 17:14 by milkwood. I accidentally stumbled upon a picture of the Sanyo Q50 and was stunned by the resemblance to the Siemens RW 777 I have. Always thought Siemens did not actually produce these turntables themselves but now I see they only changed the printing. Could you check whether the service manual for the Siemens RW 777 I uploaded just a month ago could also be useful for the Q50? Posted Fri, 08/13/2010 - 05:58 by tinojax. Yes my Sanyo Plus Q50 seems to be exactly the same as your Siemens RW 777. So the service manual you posted should work for the siemens RW 777 Sanyo Plus Q50 as well. I was able to adjust my stylus set down using this manual.